Several areas of posthumanism and new materialism necessitate critique. First, Deleuzian becoming as a basis for materialist posthumanism contains several contradictions and too much uncertainty about its particular material processes. Second, the material ontology of posthumanism is predicated on an analysis of Cartesian dualism that erroneously rejects the more-than-material metaphysical category in order to move humans out of it. The correct interpretation is that a non-clerical, more-than-material ontological category has always existed. Therefore, more-than-human beings should be reinstalled in it like they were in the time before the Enlightenment. 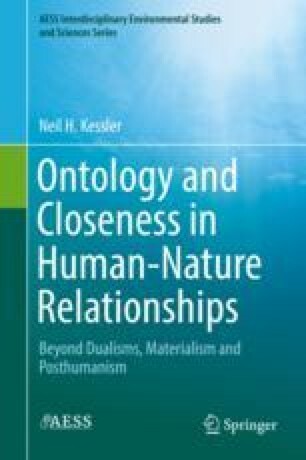 Third, posthumanist notions of human-nature relational “asymmetry” as a means of liberating more-than-human beings from humanism instead perpetuate dualist, old materialist hierarchies that leave humans as relationally superior. Fourth, Karen Barad’s agential realism positions relations as ontologically precedent to relata, which is logically untenable. Finally, though agential realisms has significant strengths, it negates human and more-than-human Selves-in-relation as ontologically basic.